Ability to book a court, or check court availability, from the comfort of your phone, tablet or PC. Simple booking process - it really only takes 1 minute to click in and book a court. Team captains and coaches can book their courts for matches and coaching activities. Regular social sessions and club nights will be block booked to ensure court availability for these sessions. Courts can be blocked out for key events such as the club championships or the county championships. The system is bedding in...some members have had problems with access and these are being investigated but many are using it with success. Instructions are available on the notice board and were emailed out last week. 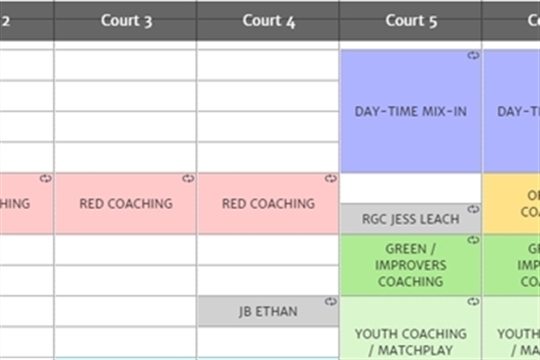 All the summer matches and coaching sessions have been loaded into the system so it is clear when the rest of the courts are free to be booked. The reality is that there are courts free at almost anytime of the day/year but this will really help those people who want to book a specific court at a specific time and also help avoid any confusion over court avilability on those busy summer evenings when matches and social nights are in full flow.